I have had this bag for a year now. I think its clumsy, big for the useable space and I just don’t like it. The big opening flap has issues with things potentially falling out because it opens the side up evry time you access it, so you effectively loose one edge to store things. It may be me but it just does not suit what I want it for. I have had this bag just about a year. Although it was great for small amounts of gear, it is just too heavy for one shoulder if you carry serious gear. I purchased this for a Canon rebel body and two lenses, thinking it would suffice when I bought more gear. I have upgraded to a 5d and L-glass, and the bag is just not useful anymore. The sling is a handy feature to swing around and grab the camera without taking the bag off your shoulder, however this is only good for the camera and not if you want a different lens. There are ways to get a lens out, but it is not worth the risk of something dropping out. I set mine down, grab what I need, and throw it back over my shoulder. It may work for small trips, but anything of a lengthy walk, such as an airshow or hike, will get to be too much for one shoulder. It would be great if you could switch the strap to another shoulder, but I have upgraded to a full backpack and will deal with lacking the sling feature. 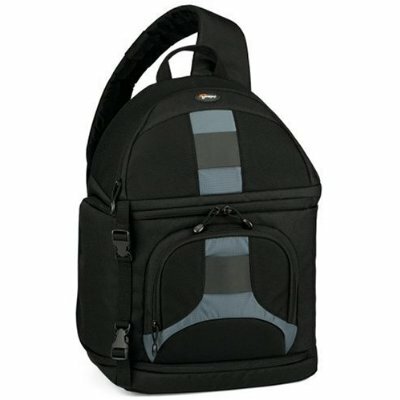 If you are looking for a bag with this much room, strongly consider a backpack instead as the review suggests. Lowepro is of the highest quality, and will not look to another brand, but this bag is just not as functional as I had hoped.